Well today was interesting!! We decided to do a small hike, just a two-mile round trip that should have taken 1.5 hours!! Being the Brits that we are we set off about 11.30 a.m. just in time for the hot midday sun. The lady at the Information Centre told us to take plenty of water and at the time we thought that as the hike was only going to take a short amount of time so the water we were carrying would be plenty. How wrong can two people be!! The rock before the hike! That’s me trying to stop it from rolling any further!! 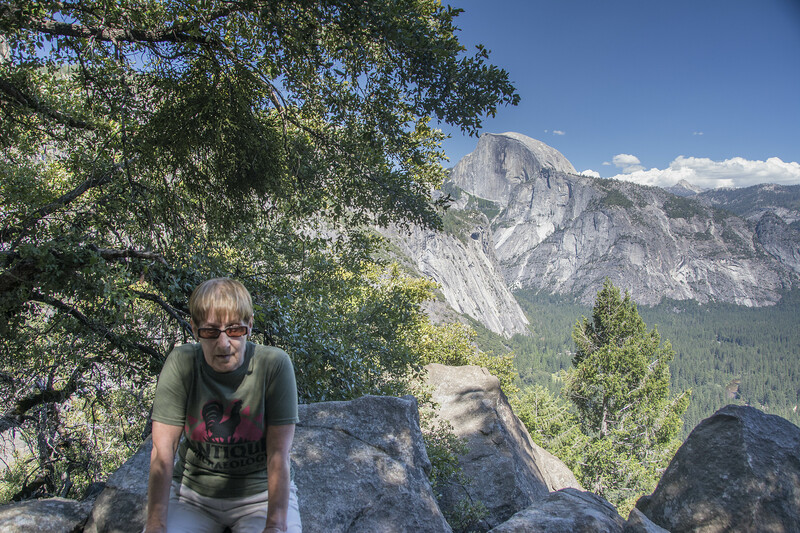 The hike we were going to do was the Upper Yosemite Fall Trail to Columbia Rock with an elevation of 1,000 feet above the valley floor, so in total about 5,000 feet above sea level. 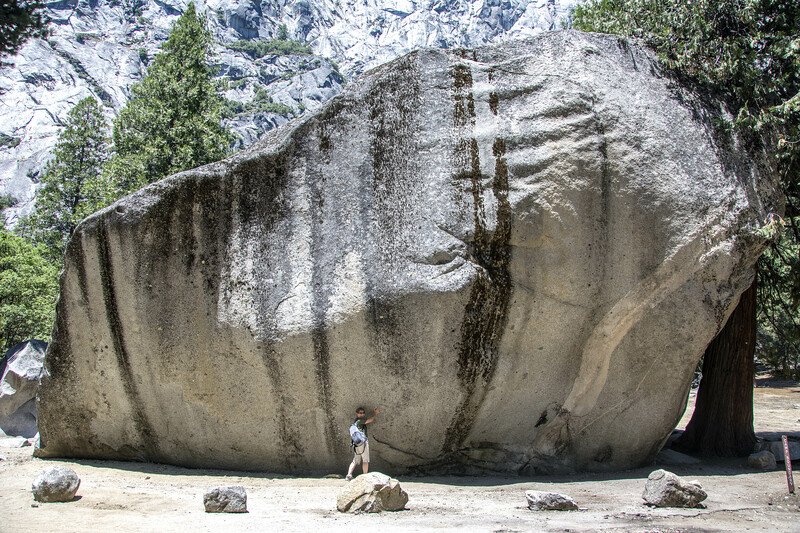 The summary of the hike was that Columbia Rock is a massive granite rock jutting from the north canyon wall a thousand feet above Yosemite Valley with the rail-lined overlook atop the 5,031-foot rock offering a distance and detailed view of the valley. 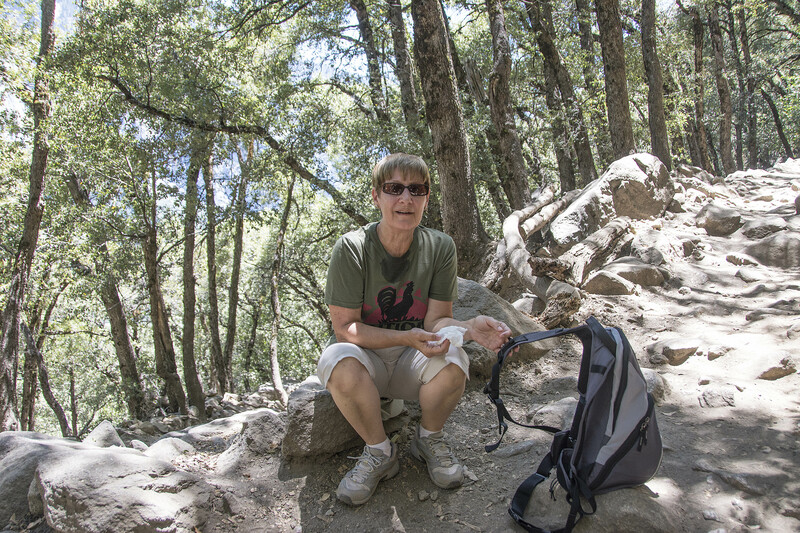 The hike follows the first steep mile of the Upper Yosemite Fall Trail – with the aid of 60 switchbacks – through oak and manzanita groves. The trail was built in the 1870s by John Conway and his crew. Not even a quarter of the way yet! 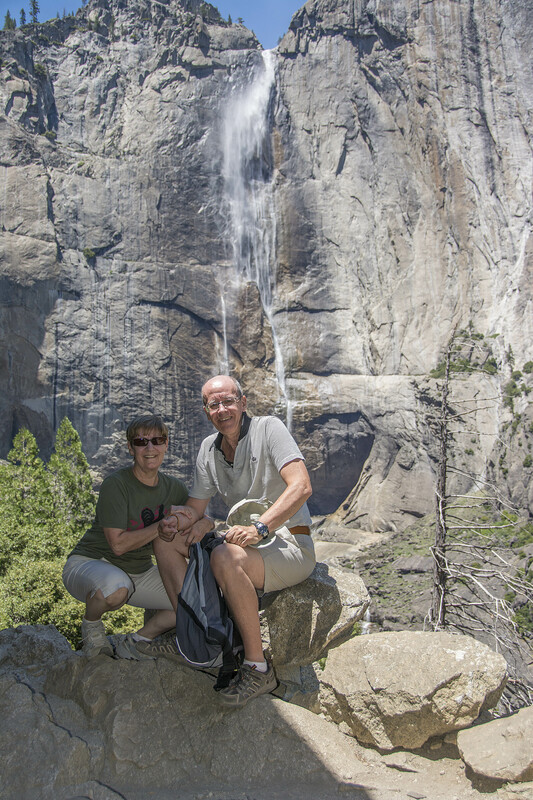 Upper Yosemite Falls – this is where we should have turned round!! 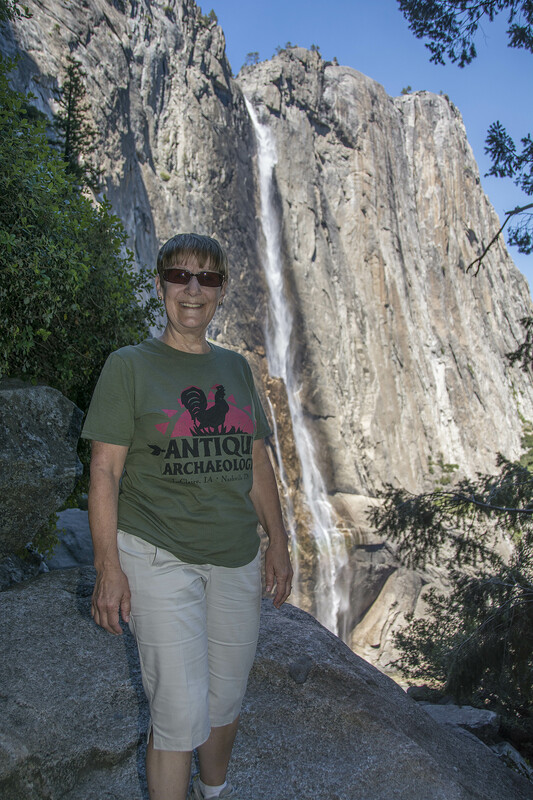 Upper Yosemite Falls – I’m feeling a lot better now! So, we set off at a steady pace in the sunshine. Yesterday was a lovely day but cool so we expected today would be much the same but no, it’s been much hotter. The path we were on first of all was gritty sand and the incline rose slowly. We stopped at various points to admire the view, take photos and refresh ourselves. However, it became apparent after about two hours that we had gone wrong somewhere!! We soon found ourselves climbing over fallen rocks and up very steep inclines. One man told us we had about another 15 minutes to walk until we reached the end of the hike and then another told us it was at least an hour. By now we were starting to feel rather tired and our water was running low. Every time we turned a bend we were confronted with more steep slopes to climb and fallen rocks. To cut a very long hike (story) short, we consulted our hiking book again and soon realised that we had already reached our destination about an hour earlier and should have turned back then!! Are we stupid or what! I told Si it was all his fault of course as he was the one who picked the hike in the first place and he should have realised sooner that we had been hiking for far too long. Us ladies know that it’s always the man’s fault, not the lady’s!!!! 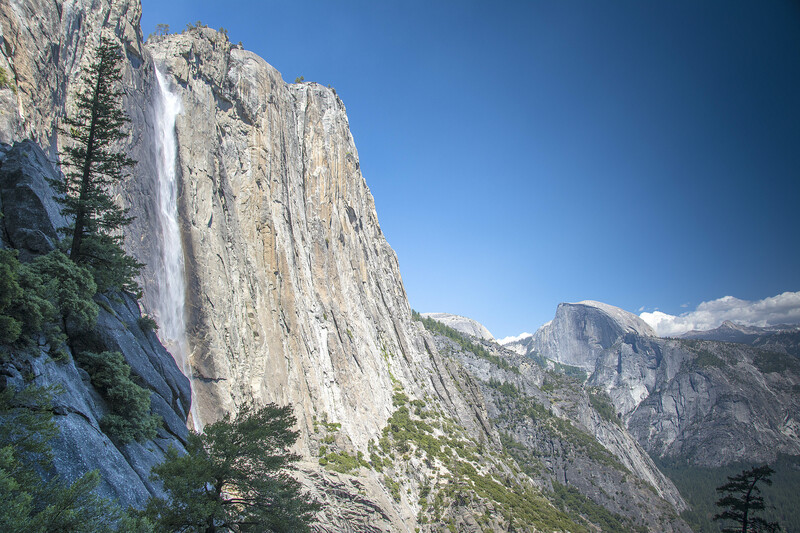 We were in fact now doing the 7.2 miles round trip that takes six hours to the top of Upper Yosemite Falls and Yosemite Point. This is usually undertaken by the more experienced climbers, not just us hikers. We decided the best thing to do was turn around and start the long decent. Well, as is usually the way, the decent was worse than the ascent. The rocks were slippery and the sand very difficult to walk on. Good exercise for the legs though and the views were magnificent! In the end the ‘small’ hike took us 5.5 hours and we covered seven miles and were at an elevation of about 6,500 feet above sea level. The snake – anyone know which snake this is? We saw a snake on our travels and a blue-jay seemed to follow us all the way up and down the hike, every so often it appeared that he was laughing at us. We hadn’t eaten anything substantial since breakfast so were very tired, dirty and hungry when we returned to the B&B and didn’t feel like going out to dinner but the day was saved when Scelestia here at the B&B kindly offered to share their wonderful family dinner of lasagne, salad and wine with us. It was like manna from Heaven!! Tomorrow (Sunday) we leave Yosemite and move on to Mount Shasta in Northern California and there hopefully, we’ll be able to update the blog for the past three days. Oh dear, that snake is creepy!! That would have made me move quicker! I LOVE the pics of your exhaustion! See…all that time off in LV now you’re back to square one! 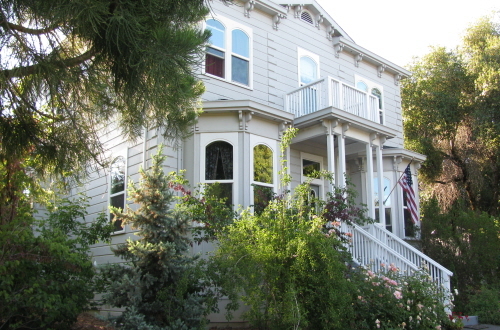 ha The B&B is very pretty. So, was the 7 mile hike Si’s miscalculation or was there another 2 mile one? The falls are beautiful!!! There was a young girl who was terrified and she ran back up towards us shouting ‘F..k, f..k, f..k there’s a snake’. It was quite funny as she comes from India so should be used to snakes. He was actually moving away from us so I think he was more scared of us!! LOL you don’t look 90 Sandra…maybe 85 😉 Uh yeah, about that snake…I would assume that it was poisonus. I don’t think they have the harmless garden snakes that we do around here. It just looks like it would be poisonus. I’m not afraid of our snakes here, but that would make me run in the opposite direction yelling those naughty words! Mmmm lasagna, I’m glad you got some nourishment after that ordeal! Thanks Dot, my friend! We’ve been searching for a pic of the snake and we think we’ve found it and it doesn’t seem to be poisonous, anyway still wouldn’t want to be too near it!! 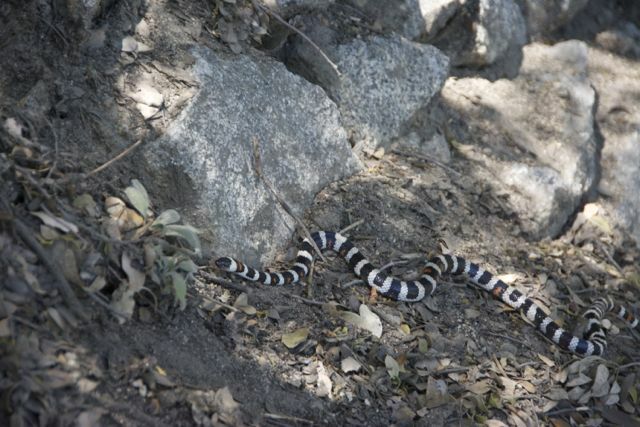 FWIW & IMHO that snake is Lampropeltis Zonata – California Mountain Kingsnake. Apparently they are non venomousness, tho probably best not to test that theory. Thanks Si, that certainly seems to be the one. Good to know it could’t have killed us if bitten!!!!! !